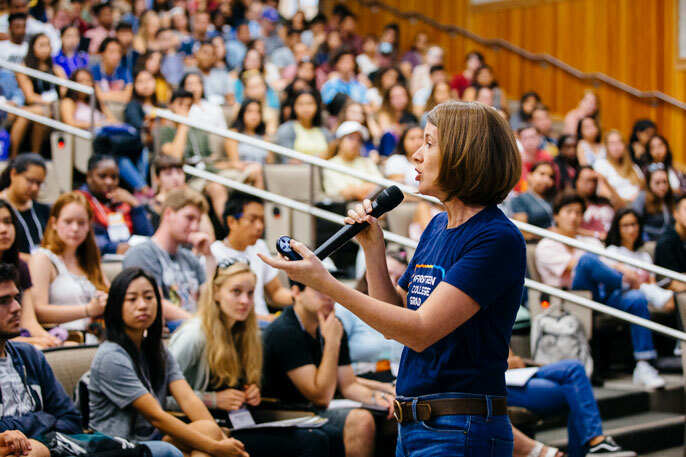 UC Davis Vice Provost Carolyn Thomas, once a first-generation student herself, speaks to a lecture hall full of incoming students. Check out the UC first-gen website for voices and stories from across the system, with links to campus and national resources. As the child of farmworkers growing up amid the citrus groves of Orange County, UC Davis law professor Cruz Reynoso would get in trouble for skipping out on picking fruit to catch up on his studies. “My mother complained to the neighbors — look at how lazy my boys turned out. Instead of being outside working they’re inside reading books,” Reynoso recalled. The only boy in his class — a segregated school for Latino kids — to complete high school, Reynoso not only went on to finish college, but to earn a law degree and ultimately become the first Latino justice on the California Supreme Court. But he might not have done any of it without a mentor: a teacher at his school that gave him a hint of what he could accomplish. Now, Reynoso is looking to provide a similar spark of inspiration for his students as part of a program that connects first-generation college students to faculty who have walked in their shoes. Cruz Reynoso shows his first-gen pride. As almost 90,000 first-generation college students — 42 percent of the undergraduate population — arrive on UC campuses this fall, more than 900 faculty across the UC system have stepped up to show them they are in good company. They include not only Reynoso but four UC chancellors and faculty from every background and corner of American society, who were themselves the first in their family to college. “What we’re doing is saying, look at these models of success,” said Anita Casavantes Bradford, a professor of Chicano/Latino studies and history. She is the founder of UC Irvine’s First-Generation Faculty Initiative, which launched in 2014 and provided the model for the systemwide faculty outreach to first-gen students this fall. The child of a single mom who relied on fast food jobs and welfare payments to support her three daughters, Casavantes Bradford started a first-generation faculty mentorship program at UC Irvine after seeing the impact that sharing her story had on her own students. The UC First-Generation Faculty program, which has now been adopted across each of UC’s 10 campuses with the support of the UC Office of the President, aims to recast the lofty figures at the head of the class as relatable role models that students can seek out for advice. As students start the fall term on seven UC campuses next week, they will notice hundreds of faculty sporting brightly colored T-shirts and buttons proclaiming themselves to be first-gen college grads. Beyond visibly identifying themselves to students, faculty are sharing their stories and experiences on a UC-wide website and in social media, and incorporating their personal stories into their lectures on the first day of class. They are also participating in more direct efforts to connect first-generation faculty and students, such as through lunchtime meet and greets and panels on navigating the college environment. “Many of us had people who helped us on our journey, and we’re paying that forward now with mentorship to students,” said UC Davis Vice Provost Carolyn Thomas, who has helped galvanize an effort on her campus that is almost 400 faculty members strong. UC stands out among the nation’s top universities in welcoming large numbers of first-generation college students. Those students not only enroll, they succeed, graduating at high rates and going on to do well in the workforce, in upwardly-mobile careers. Still, because they are entering a completely unfamiliar environment, it can take first-generation students some time to orient themselves and find their footing on campus. The semester or two it takes first-gen students to learn their way around the norms and culture of the academy — what some have called the “hidden curriculum” — can have long-term consequences. A poor first quarter or year can drag down a student’s GPA in a way that limits options for graduate and professional school. Worse, being put on academic probation can affect a student’s access to financial aid, jeopardizing their ability to continue their studies. Rather than seeing first-gen students’ struggles during this initial transition period as the product of a presumed academic or social deficit, Casavantes Bradford describes it as stemming from something similar to the culture shock many people experience when moving abroad. Nor are their struggles necessarily due to a lack of campus resources. UC has a wealth of services on the campuses aimed at supporting first-gen students. These include academic, financial and community-building resources as well as dedicated programs, like opportunities for summer research and study abroad, to help them make the most of their college experience. The problem: Newcomers to the campus environment — especially those without family members to guide them — don’t always know about the resources or how to access them. “First-generation students are entering a foreign country. Our students need someone to give them a map, and they need to know what the rules are,” said Casavantes Bradford. Students raise their hands as UC Davis Vice Provost Carolyn Thomas asks who in the room is a first-generation student. Almost half of new UC students are the first generation in their family to college. As those most closely connected to students’ progress, she said, faculty are uniquely positioned to help. “The missing link is a human being — a person who can say, hey, you’re struggling in my class. Here’s where you can get extra tutoring, and don’t worry about the cost. We have a subsidized tutoring program, and let me put you in contact with that person,” said Bradford. Beyond helping students, the First-Generation Faculty program has provided faculty members with an avenue to share ideas and strategies that they say make them stronger educators. Many say it has offered a forum for reconsidering their own experiences as first-generation college students, something they had viewed as irrelevant — or potentially even limiting — to their status as professors. “It is really exciting how this enables people from all ages and backgrounds to find common ground with their students, and with each other,” Thomas said. Some hail from blue-collar families where studying was seen as shirking out on work. Others are the children of immigrants who came to America with the single-minded ambition to provide a better life for their children — with a college education central to that plan. But all know what it’s like to arrive in the unfamiliar terrain of the university environment, and to learn how to navigate without a map. “A university education was life or death for me. I knew getting a degree was the only pathway to a safe, decent future, to living in dignity, to having some feeling of security,” said Casavantes Bradford. Learn more about first-generation faculty and students in the video below. The UC First-Generation Faculty program was created by Anita Cassavantes Bradford, associate professor of Chicano/Latino studies & history at UC Irvine and is in place at all 10 UC campuses. The effort is part of UC President Janet Napolitano's Student Opportunity Initiative and commitment to economic and workforce development in California. The New York Times: Courting First-Generation Students at U.C.